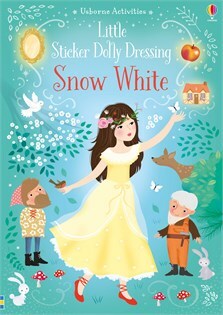 A magical retelling of the story of Snow White with stickers to dress the dolls in delightful outfits. Scenes include Snow White meeting the seven dwarfs, taking a poisoned apple from the wicked witch and finally meeting her prince. With over 200 reusable stickers of clothes and accessories, plus a fold-out back cover to ‘park’ stickers.